One of the many places that Raghavendra Swamy or Rayaru (1595-1671) stayed in during his sanchara or pilgrimage in south India was Srirangapatna, an island town, just 30 minutes away from the royal city of Mysore. Srirangapatna in the seventeenth century was a much bigger town than Mysore and it was the capitals of the Wodeyars. It was sometime in 1610 that Raja Wodeyar had defeated Tirumala Raya, the Viceroy of Srirangapatna, and made it his capital. Since then Srirangapatna had continued to be the capital of the Wodeyars. 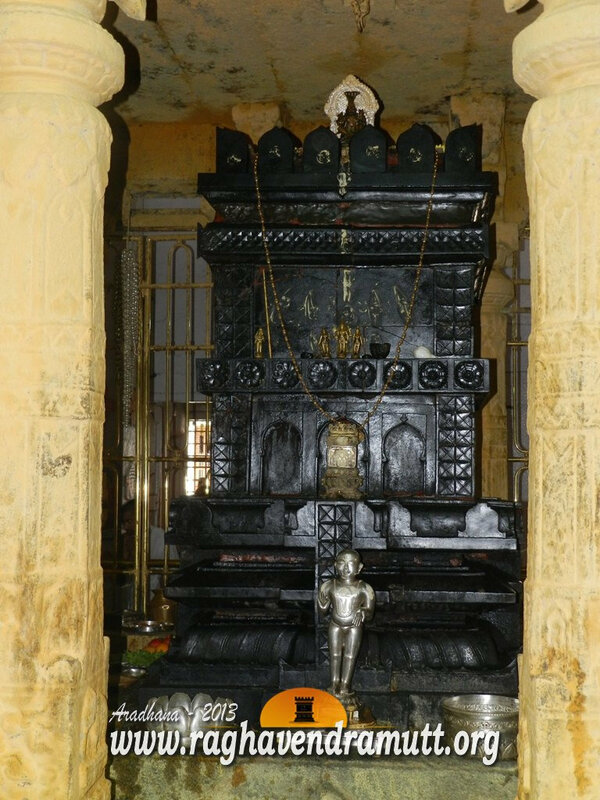 In 1659 Dodda Deva Raja, also known as Dodda Kempa Deva Raja, ascended the throne in Srirangapatna. A little after Dodda Deva Raya came to the throne, Raghavendra Swamy decided to take a tour of all the holy places in south India and he set out from Kumbakonam for this purpose. Kumbakonam was the headquarters of the Srimatha that Rayaru headed. Raghavendra Swamy had taken over as the head of the Sri Matha after his ashrama guru, Sudhindra Thertha had entered Brindavana in Nava Brindavana near Hampi in 1621. Rayaru started from Kumbakonam and he visited several towns and cities s where he gave discourses, performed innumerable miracles and spread the message of Madhwacharya. He reached Nanjangud, which was part of the Wodeyar Kingdom. When news of his arrival reached Dodda Deva Raja Wodeyar, the King hurried to Nanjangud with his officials and gave a ceremonial welcome to Rayaru. Dodda Deva Raja was the fourth son of Prince Devarajendra Wodeyar, by his second wife, Kempamamba Ammani Avaru. He was imprisoned with his father at Hengul Fort in 1638, the year of incumbency of his cousin Kantirava Narsaraja, the first. He was adopted and appointed heir apparent with title Yuvaraja on July 28, 1659. He succeeded his cousin on the latter’s death on July 31, 1659, and was installed on the Mysore throne on August 19, 1659. Dodda Deva Raja met Raghavendra Swamy and entreated him to come to his capital of Srirangapatna. Rayaru realsied that Vijendra Theertha, his parama guru had visited Srirangapatna. He also recalled that Vibhudendra Theertha had also visited Srirangapatna. But as it was the month of Ashada, Raghavendra Swamy wanted to stay at one place and observe Chaturmasa Vrata. When King Dodda Deva Raja Wodeyar learnt about it, he repeatedly requested Raghavendra Swamy to come over to Srirangapatna and observe Chaturmasa in the capital. Raghavendra Swamy agreed to the King’s request and set out for Srirangapatna. Once again, the King gave a magnificent reception to Rayaru and welcomed him into the capital. The King met Rayaru on the outskirts of Srirangapaatna and escorted him into Srirangapatna. Rayaru then performed pooje at the palace of the King (This palace no longer exists as it was deliberately pulled down by Tipu Sultan). Since it was Ekadashi (Monday, July 6), Raghavendra Swamy gave theertha to everyone, including the King. He blessed everybody before going to the Ranganathaswamy Temple. The King then gifted Nallur villge, which is also called as Devarajapura near Sargur to Raghavendra Swamy. He also gifted gold and ornaments to the seer who dedicated them to his beloved Moola Rama. After completing his Chaturmasa at Srirangapatna, Raghavendra Swamy left for Chitradurga where he gave moksha to one of his disciples. There have been thousands of scholars, posts, composers and Dasasaa who have written about Raghavendra Swamy, the saint of Mantralaya, his life and times. Since the works on Raghavendra Swamy, who is affectionately called Rayaru, is voluminous and extensive, there are many compositions and even composers whose works remain in the background. Many seers of the Mantralaya Raghavendra Swamy Matha and other mathas have composed songs on Rayaru. One such is Vishvendre Theertha. Vishvendra Theertha was the pontiff of the Sode Matha, which is one of the asta or eight mathas of Udupi founded by Madhwacharya himself to take care of the Udupi Krishna Temple. The Sode matha has a hoary history and before Vadiraja Theertha (1480-1600), it was known as Kumbasi Matha. The first pontiff of the matha is Vishnu Theerth, the brother of Madhwacharya. The 34th pontiff of the Sode matha was Vishvendre Thertha. He was given deekshe by Vishvadishe Thertha. He was a great devotee of Raghavendra Swamy. This is one of his composition on Rayaru. The lyrics are in Kannada. His ankita was Rajesh Hayamukha. (Hayamukha here means horse face and the seer adopted this ankita in honour of Hayavadana-the God that Vadiraja Theertha worshipped). Gopala Dasa (1722-1762) is one of the prominent figures of Haridasa Sahitya or Dasa sahitya movement. Born as Bhaganna in Mosarkallu near Devaadurga of Raichur district, he experienced severe poverty during his childhood. He came to Uthanuru where he stayed in the temple of Prana Devaru with his mother, Venkamma, and his brothers, Seenapppa, Dasappa and Rangappa. He was a disciple of Vijaya dasa who set him on the path of Hari bhakti. He initially composed poems under the ankita Venkatakrishna. Later on, he wrote under the name of Gopala Vittala. Gopala Dasa gave Deekshe to all his three brothers who became composers of note. Seenappa became Varada Gopala Vittala, Dasappa became Guru Gopala Vittala, while Rangappa was given the ankita Tande Gopala Vittala. Here are some of the works of Dasappa or Guru Gopala Vittaala. All the songs are on Raghavendra Swamy. Needless to say, Dasappa was an ardent devotee of Rayaru. As we can see, the songs are rich in melody and they have a charm of their own. The style too is unique. He studied shasthra under Sri Vyasathathvajna who was earlier known as Venkata Ramachar. No wonder, Dasappa’s works reflect his deep knowledge of the shastras. The Nadi or Nadee Taratamya Stotra by Raghavendra Swamy is in Sanskrit and it gives us the names of many rivers such as Ganga, Cauvery and others in just eight slokas. Raghavendra Swamy has said in the stotra that while bathing in these rivers, we must give argya to the Nadi Abhimaani Devaru or God. He says we should follow the hierarchy of rivers while giving argya. This is similar to Taratamya of gods. In the Stotra, Raghavendra Swamy makes it clear that Ganga is the holiest among all the rivers and she is the first in the hierarchy or Taratamya of rivers. The Godavari comes second in Taratamya.With the exception of the Ganga, many of the rivers share the same Kakshya (In English, this word can be translated to mean class, abode, seat or place). Guru Jagannatha Dasa (1837-1918) was one of the most influential Haridasas of the nineteenth and early years of the twentieth century. He is credited with having composed the maximum number of songs on Raghavendra Swamy or Rayaru. Guru Jagannatha Dasa is from Kosigi and he is often confused with Jagannatha Dasa (1728-1809) of Manvi who wrote SriHarikathamrutasara. Guru Jagannatha Dasa wrote under the ankita Guru Jagannatha Dasa, while Jagannatha Dasa of Manvi wrote under the pen name Jagannatha Vittala. This was because Jagannatha Dasa was sent to Pandrapur, now in Maharashtra, by Gopala Dasa where he was told that he would find a stone with ankita and that should be the name he should use in his compositions. He found the stone bearing the sign Jagannatha Vittala and, hence, he used it in his compositions. Guru Jagannatha Dasa was born twenty eight years after the death of Jagannatha Dasa of Manvi. While Manvi is near Raichur, and both are in Karnataka, Kosigi is near Adoni and both are in Andhra Pradesh. This is a stotra or prayer called Raghavendra Raksha Stotra composed by Guru Jagannatha Dasa on Raghavendra Swamy.